I restored this very early London made Distin alto for trumpet player Louise Baranger about 25 years ago (see last photo on left). It was pretty battered, but well preserved in most ways and plays quite nicely. It retains most of the original silver plated finish, case, bit, shank for F and crooks for E and Eb. The mouthpiece is from a later instrument, but appropriate style and size. I guess that the additional storage holes in the case were for two additional bits of different lengths and perhaps a second mouthpiece. The two small holes near the crooks may have been for some sort of music holder. The over all length with mouthpiece removed is 14 1/2", the bell rim diameter is 6 1/2" and the bore measures .423". In addition to the name stamp seen in the fifth photo down on the left is a trademark stamp on the inside of the bell, almost hidden by the large tubing branch. This is reminiscent of Adolphe Sax's monogram as seen on instruments from that shop including the Sax cornet featured elsewhere on this site. This was certainly a deluxe and expensive instrument for the time based on the silver plating, plush case lining and leather covering. 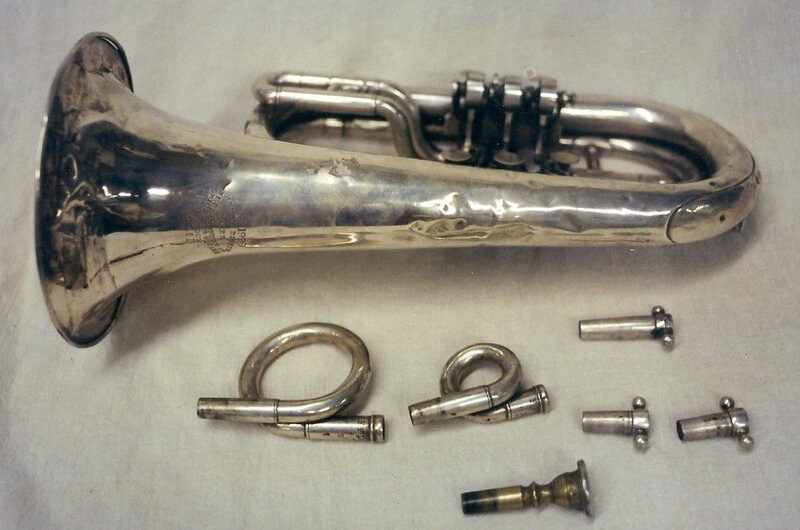 This is very likely the sort of alto instrument that was being used by the Distin Family Quartet at the time and the use of the name "flugelhorn" is interesting. Distin had recently started using rotary valves along with Perinet piston valves and had discontinued the Berlin piston valve instruments made by Sax that they had sold previously. Henry had taken over the business from his father and changed the business name to his name. This was also the time that they started making their own instruments. Another, similar alto/tenor instrument exists from about 1850 with the name "Le Famille Distin / T. Distin, London" on the bell. In 1854, there were several London concerts given by Distin's Flugel Horn Union, presumably a larger band of German style brass instruments in trumpet form. Illustrated in Distin's 1857 catalog is an instrument very much like this with the description: "Tenor flugelhorn in F, Rotary-action Cylinders, with crooks for E and Eb". This alto could easily be confused for a German or Austrian instrument, the mechanism being the same, including the external lever spring tension adjuster. It is known that Distin had imported piston valve sections from France for use in his production and it seems at least as likely that this valve section was purchased from a German or Austrian maker. Mitroulia (see below) also reports that Distin had at least one German instrument maker under his employ at the time. There is little doubt that Distin was expanding his manufacturing capacity and was making his own piston valve sections from about this time on. The supplying of rotary valve instruments seems short lived, other styles having become well established domestically. I feature three Distin cornets on this website, including a Bb cornet made in London almost fifteen years later. Most of the historical facts above come from the most recent and best research on Adolphe Sax, by Eugenia Mitroulia, and includes an extensive chapter on Distin. For those interested in the history of brass instruments, I highly recommend reading this dissertation.